Would you like to have a United States mail address? We provide USA mailbox rentals. 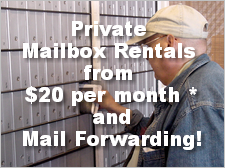 We rent mailbox’s for both business and personal use. We are a street address not a p.o. box. You send all mail and packages here, then we can forward them anywhere in the world for you. We currently serve people located all over the world. If you need a US mailing address please contact us. The Mailbag has been serving clients since 1984. * 3 month min. – new customers be sure to use our online web coupon special! 25 years of service and over 700 mail box rental units! The Mailbag has been in the same location and serving clients for over 25 years with fast, friendly and courteous service. We are proud to be able to serve our local customers and the international community having become one of the largest mail box rental stores in the USA with over 700 mailboxes. Great for people on the move! 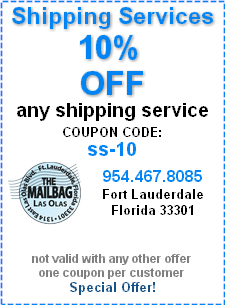 or wish to have a United States mail box rental in Fort Lauderdale, Florida we have you covered at The Mailbag! We now offer scan and e-mail services of your mail. We will scan your bills and e-mail them to you! The Mailbag is now offering free package notification to all mailbox customers. You will receive an email when your package has arrived in the store. Mailbox customers are very pleased with this extra service. This service saves time in their busy day from having to phone or email the store. Shipping, Receiving and Mail Forwarding Services! Our services include receiving your mail, and accepting packages from carriers such as, UPS, FED EX, and DHL. Just address everything you order in your name and box number to the Mailbag. We will hold your purchases and deliveries while you are away. We can also forward the items, if you would like, to another location while you are out of town. We offer call in service to check for your mail and packages! If you are waiting for a particular piece of mail or a package to arrive call us or e-mail us anytime to see if it has been delivered to your mailbox. We can also make a note to call or notify you by e-mail when something important has been received especially items such as perishable goods; including flowers, refrigerated food items as seafood and medications. Our customer service will provide you with an excellent price. Our prices are lower that the UPS Store, DHL direct, or the FEDEX Store. The Mailbag is individually owned and operated on a daily basis to provide individualized attention to our customers. The Mailbag is not a franchise. Our expenses are lower so therefore we pass the savings on to our customers. 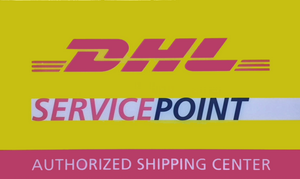 Shipping by DHL rates to South America and other various countries are often less expensive than UPS or FEDEX rates. Come in to the store at your convenience for a free estimate and we will provide you with all your shipping options. Whether you choose DHL, FEDEX, or UPS with free tracking. You will see the difference in lower pricing at the Mailbag. We also provide free tracking for packages shipped through the U.S. Post Office with destinations within the U.S. The United States Post Office charges for this service. We take care to gently pack boxes for safe arrival of your items. Our reputation as personal owners is extremely important to satisfy our customers. Luggage Shipping to your destination! Bring us your bags we can ship them. Save time and effort of taking them to the airport. We can send them directly to your destination. Less stress. We can beat anyone price on luggage shipping. We specialize in International Shipping. We will beat any competitors price by at least $10.00 most of the time. We ship using Fed Ex ,DHL, and UPS. We also can pack your item correctly so it get to the final destination in perfect condition. We have great selection of sizes. We can also provide you with tape and packing materials. Let us pack those fragile items for you. Our 25 years of experience in packing so we know exactly how to do it right. All customers receive email when their package arrives. during normal business hours or use our contact email forms to find out more about our sign up details and information!